It’s been a challenging week...we are trying to get around to visiting all nests, identifying all banded birds, and it’s a huge task these days. Some of us are growing increasingly sad as we visit and revisit a nest where a beloved Osprey has resided in the past....and we keep finding an empty nest, or another Osprey there in his place. I have visited the nest where our beloved, formerly “single” Dad lived. He raised three chicks alone two years ago and earned a permanent place in my heart. I have not seen him. Today I found another male on that nest. My heart sank. One of my most dependable and devoted volunteers is also feeling a sense of loss as her “first love” in the Osprey world has not returned to his nest. These losses are inevitable and I have lost many ospreys that I loved, but it’s never easy. We do grow attached, while we know these are wild creatures and migration is not without great challenges. I also received a call about a dead Osprey, so I rushed out to check the identity. I was relieved to find that it was not the banded male from a nearby nest, but probably a young male, trying to establish a territory and suffering a catastrophic wing injury. 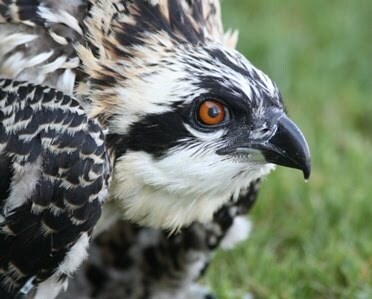 Every loss, of every beautiful Osprey causes me great sorrow, even after 25 years. They are just so stunningly beautiful. Holding the limp body of such a perfect creature is a gut wrenching experience. Life can end so abruptly. On a happier note, some of our favorites have returned and the first eggs have been laid. Chicks are on the way! I have also found some nests removed, and some ospreys are having to start over, rebuilding their nests quickly. We will keep making the rounds, reading bands, observing behaviors, doing what we can to keep up the research, collect the data, rescue birds when necessary, educate the public and build relationships in the community. Hoping that we can help each of you to fall in love with these magnificent raptors. Happy Easter, Happy Earth Day. I finally had a day that I could spend making some rounds and checking nests. I visited 20 nests. 11 had no ospreys on them, 4 had one bird, and five had a pair. I read three bands. Several other females were uncooperative as far as revealing their legs! Three males were older established males that I have known for quite a while, back on their nests. That may give you some idea of where we are regarding the return of our Osprey friends. In addition, one nest had been removed from a cell tower. Sigh. No sign of any rebuilding there. I saw no birds at the Arboretum nest which has the cam. It was a lovely cool, but bright day (hard for band reading.) It was so nice to be out there, watching, listening, enjoying my Osprey friends. Some lakes are still partially frozen...so don’t panic if your favorite Osprey is not back yet! We had a slow start last year, and it looks like we are experiencing the same thing this year. I expect we will see many more of our friends this week! As I was coming home today, I saw a male Osprey doing a sky dance, so of course I checked the nearby nest and sure enough, a female was sitting there. He was trying to impress her! I am always impressed with this courtship display! I usually hear it before I actually spot the male, high in the sky, performing this mating ritual. I saw this video (link below) and thought it might be a good teaching video for new volunteers have not yet witnessed this display. It still thrills me to see it! I checked a handful of nests today, and saw one of my dear, favorite male Ospreys working diligently on his nest. I also checked out a new nest, new to me anyway, occupied by two unbanded ospreys! I still have another new one to check out on the other side of town soon. The population keeps booming. I am sure there are many nests that I don’t know about, so please do send in your reports of new nests, as we are doing our very best to keep track of them all! Lots of reports are coming in from around the metro about ospreys back on their nests, and I deeply appreciate each and every one of them! Hope everyone hunkers down during this spring blizzard they are predicting....5-15 inches of snow! Well, ya all probably knew I couldnt wait to see my first Osprey, so I ran up to a nearby nest and watched a banded female, band read, as she picked up sticks off the ground and worked on the nest. I watched for an hour, my heart racing...what is it about these birds? But I have to stay focused on my income producing work this week.....holy smokes it’s gonna be hard. So the 2019 Osprey season has officially begun! There are are still a lot of volunteer monitors that I have not heard from, and we always need help watching all these nests.....and if anyone wishes to make a donation to support this field study in its 26 th year...we have a Twin Cities Metro Osprey Watch page at Go Fund Me to take donations. I know that many of you are waiting to hear something from me! Yes the reports are coming in about the first ospreys back on their nests here in the Twin Cities. I have been so busy with my pottery business and a big show next week, as well as teaching three full classes a week now....that I have not had much time for ospreys. Gotta earn some money so I can afford to start putting on the miles visiting nests. Anyway, this is a heads up for the volunteers.....Osprey season has begun, finally! I may buzz up to a nest or two tomorrow if I can.....so do keep me posted about your observations! Even tho we are still in the depths of winter here with several feet of snow on the ground, our Osprey friends will return sometime in the upcoming weeks.....not sure how many weeks. So I once again am putting out a call for volunteer nest monitors. If you have monitored in the past, and want to return to your nest this year, please let me know. Experienced volunteers become more and more treasured each year as your knowledge and instincts improve and increase each year. If anyone else is interested, we ask for a commitment to visit your nest at least once a week, thru the breeding season, April to September. After each visit you will need to send an email sharing your observations. We have a list of guidelines for what data we are trying to collect at each nest. It is helpful to either have a spotting scope or a good pair of binoculars to be able to closely watch for specific behaviors. If you will be unable to visit your nest for a week or two, (vacation, illness, whatever....) all I ask is that you let me know so we can plug in another monitor or I will check the nest. We have nests in all eight metro counties, tho none are in the heart of the city, so you may have to drive a ways to monitor a nest. I like to spend some time in the field with volunteers when we are able to coordinate schedules, tho it doesn’t always happen. But I am always happy to answer questions in emails. The more questions you ask, the more you learn! The project is always growing and we always need help watching over all these nests. It can be a life changing experience to get to know a family of ospreys and many of our long time volunteers have fallen deeply in love with “their” ospreys! Here are all the 2018 results, for those of you who like the numbers/ details! Spring came quite late in 2018, with winter hanging on well into April. The first Ospreys were not reported until ‪April 10-11‬! A heavy snowfall of over 12 inches blanketed the Twin Cities metro area ‪on April 15.‬ I observed my first Ospreys ‪on April 12‬ and successfully read the first bands that day. Ospreys arrived slowly and the first signs of incubation were not documented ‪until April 26.‬ In comparison, we have had eggs laid as early as ‪April 12‬ in past years. There were 205 chicks that were known to have fledged successfully or survived to fledging age! (214 in 2017). Most successful nests had two to three chicks, 51 nests with two chicks, 29 nests with three chicks, and 16 nests that produced a single chick. The mortality rate this year was higher than last year with 19 chicks which were known to have died or disappeared before fledging, (19 last year also) and with three adults which disappeared mid-season and were presumed to have died. There were 15 nests that failed after signs of hatching were observed but before we were able to see or accurately count chicks (five last year), seven nests where no signs of hatching were ever observed, nine nests where the cause of failure was unknown, in addition to the nine nests were no eggs were laid. There were only 87 adult Ospreys identified by their bands, as the number of banded birds continues to drop. Three of these were from Iowa. We located 12 new nesting territories, including four nests that were newly discovered this year although reports indicated that they had been there for one or more years. Only two of these new nests successfully fledged chicks. In addition, there were six nests which had been unoccupied for 3-20 years, which were reoccupied this year. There were also 14 nests which had been occupied last year that were not occupied by Ospreys this year. One of these was taken over by geese and two were taken over by Great Horned Owls. There were eight banded Ospreys which were believed to have bred successfully for the first time and their average age was 4.75 years old. (Average age of first successful breeding for males this year was 4.71 years and for females it was five years). It is interesting to note that of the 136 occupied territories this year, 75 were on osprey nesting platforms, 23 were on cell or radio towers, 18 were on ballfield lights, 15 were on a power pole or transmission tower, and three were on other manmade structures. Two nests were built in a dead tree late in the season, with no eggs laid. The overall productivity of occupied nests which were successful this year was 71%, (72% in 2017, 76% in 2016, 68% in 2015, 70% in 2014, 67% in 2013, and 77% in 2012). The mean number of young fledged per successful nest was 2.13% (2.25 in 2017, 2.24 in 2016, 2.43 in 2015, 1.77 in 2014). The mean number of young fledged per active nest was 1.64%, (1.75 in 2017,1.84 in 2016, 1.88 in 2015, 1.41 in 2014) and the mean number of young fledged per occupied nest was 1.51%, (1.62 in 2017, 1.70 in 2016, 1.65 in 2015, 1.25 in 2014). These numbers reflect a slight decrease in overall productivity per nest, although the number of chicks fledged per successful nests remained similar to last year. There were two nests which have failed for four years in a row. There was a baffling and disturbing outcome on one nest, where the single chick was discovered alone on the nest. Three monitors took turns watching over this nest closely for nearly a week, and no adults came to care for this chick. Other adult Ospreys showed up occasionally, but provided no parental care. In fact, they seemed to cause the chick distress. It was through careful behavioral observations that we concluded that these visiting ospreys were not this chick’s parents, and it appeared that both parents had died somehow, since adults typically do not abandon their offspring. The nest was in a very inaccessible spot, on a large transmission tower in a lake, so mounting a rescue involved considerable legal and physical hurdles and we were not able to arrange for this before the chick died / disappeared. Those involved with this situation were deeply saddened and suspected that these adults may have been killed. It is very unusual for two adults to die at the same time. The three oldest males this year, dropped to 15 years of age. Our oldest male last year at 23 years, did not return. Two additional older males, 18 and 17 years of age last year, also did not return. Our oldest females are younger with four that were 11 years old, which all bred successfully. It is interesting to note that we have recorded 2,270 chicks which survived to fledging age on monitored nests in the metro area since the inception of this project in 1984.